Ascent Guide: Edward Feuz jr.
Named for: The name Devil's Head is a translation of the Stoney Indian name based on the mountain's shape. 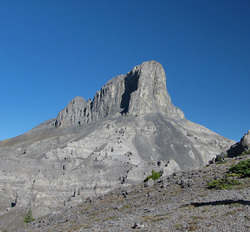 George Simpson passed by the peak in 1841 and described it as having a, "rude resemblance to an upturned face." It is said that the mountain was somewhat feared by the natives who had superstitious stories about it. In her book, "West of the Mountains: James Sinclair and the Hudson's Bay Company," Geneva Lent wrote, "As the train drew closer to the main range of the Rockies, a great grey escarpment seemed to loom directly before them, as if to block all entry to the mountains. The Cree Indians so feared theis peak they made propitiatory offerings to its Manitou in the form of pipes, tobacco, and decorated tomahawks on certain of its ledges." On 7 August, 1858, as he approached the mountain front, James Hector noted the feature as well, writing, "Half an hour after starting this morning we came to Deadman's River (Ghost River), and found that the plain we had been admiring the previous evening was really the valley of that river, which rises near the 'Devil's Head'"
W.S. 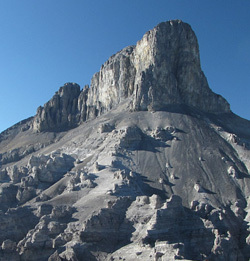 Drewry, an assistant to James McArthur, attempted to climb the mountain in 1891 while in the area surveying but was turned back by the precipices below the summit. 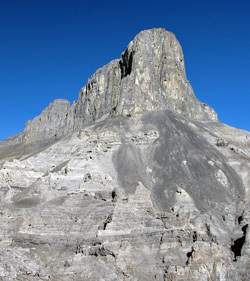 The peak's challenging cliffs must have been noticed by all the early mountaineers as they journeyed by train to make first ascents in the more spectacular main ranges of the Rockies during the early part of this century. However, Devil's Head's somewhat isolated location and distance from the railway combined to delay the first ascent until 1925 when J.W.A. Hickson and L.S. Crosby climbed the mountain from the west, guided by Edward Feuz jr.